ST. GEORGE – Anyone who likes to walk briskly, cycle or just meander along the many walking and biking trails in St. George can let transportation planners know what they’d like to see in the city’s future by taking an online survey. 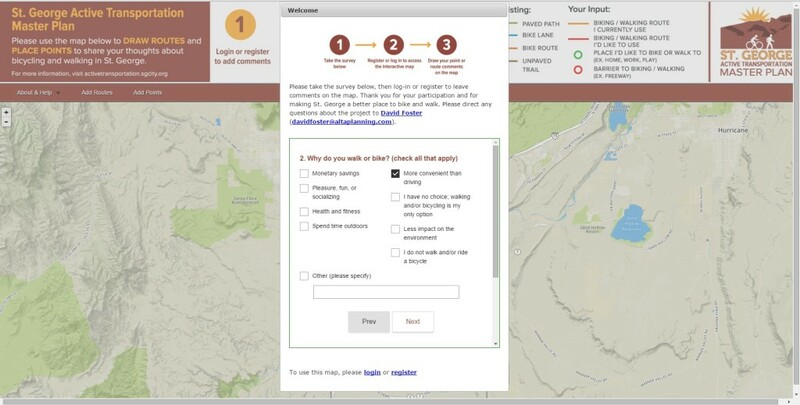 The survey and interactive map rolled out by the City of St. George is meant to gather public input for its active transportation plan. Active transportation covers walking, running and cycling, in addition to the infrastructure that supports it. 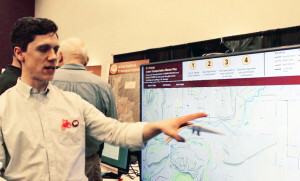 “This will drive the recommendation phase of the plan,” Tom Millar, a consultant with Alta Planning and Design, said about the survey during the 2016 Dixie Regional Transportation Expo held Feb. 9. The survey – which can be accessed here – goes through five questions including the survey taker’s reasons for using active transportation to what obstacles may discourage them from either walking or riding a bike. There are also questions to help fine tune the future of walking and bicycling routes within the city. Survey takers can enter their own thoughts and suggestions about what what they want to see before signing off. Once the survey is completed, people can move about on the interactive map. They can see where present trails and bike routes, both paved and unpaved, currently exist. They also can pinpoint where they may want to see new trails or bike routes and related infrastructure. “So what we’re asking people to do is to look at the map we have and look to see where there are bike lanes, and then identify where on the map they would like to see more trails, more bike lanes, improved sidewalks, “Millar said. It can also be as simple as asking for a crosswalk on a street where none currently exist. “They can put a little dot on that spot and they can give us a little more information about why it’s important to them,” Millar said. Through the input given on the map and the survey, planners hope to identify ways active transportation within the city can be improved and better integrated. The ultimate goal is provide a highly connective and integrated system that will be part of the city’s overall transportation system and also provide a viable alternative to vehicle use. The Plan will identify needed retrofits as well as future infrastructure and will also look at the expected maintenance and operations budgets. The Plan will also include goals, objectives, policies, maps, and approaches for implementation. The end product should be both a stand-alone document usable as a guide to future activities and easily integrated into the existing St. George City Transportation Master Plan. Recommendations within The Plan should avoid or fully identify any conflicts between the existing Transportation Master Plan and the Active Transportation Master Plan.